The IGI D Show hosted by the International Gemological Institute, IGI India, concluded on a highly positive note. The theme for this edition was 'Designing For The Millennials' and the merchandise on display witnessed the convergence of contemporary and ethnic designs. The show, hosted at the Goa Marriott Resort and Spa from July 2nd, witnessed quality interaction among 29 handpicked manufacturers and over 100 prominent retailers. The unique format of the show enabled the participants to connect and associate with each other not just during the prearranged meetings but also over the next four days, creating transformational relationships. This year, Aakaar, the design studio was the focus of attention where senior designers from IGI interacted and imparted valuable insights on the aspects of creative and theme based designing. From choosing a form (Aakaar), attaining inspiration and finally creating exquisite jewelry, the retailers were made acquainted with the techniques to cater to a generation that, which is the future of the industry. "This edition of the IGI D Show was a phenomenal success with over 2000 quality interactions taking place within a professional ecosystem. This year, the event revolved around the millennials and Aakaar, the design lounge was an initiative to help the manufacturers and retailers comprehend the millennial's desire in jewelry. 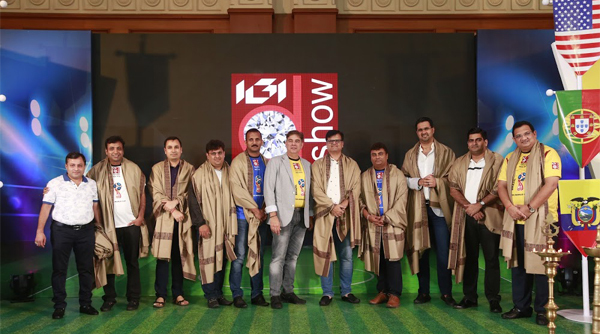 Through the show, IGI has succeeded at introducing the fraternity to an amazing confluence of ideas, novel creations, unexplored business avenues and most importantly, invaluable knowledge and fructuous relationships," said Tehmasp Printer, MD, IGI India. Ever since its debut back in 2011 at Hyderabad, the D Show has evolved into a true networking platform that is way ahead of its time. It now plays a crucial role at establishing a common ground for both manufacturers and retailers to connect, associate and grow. Apart from the commercial aspects, the show also serves as the hub for unsurpassable knowledge; an aspect, indispensable to the growth and development of the fraternity.